President Trump argues that Dodd-Frank has been a "disaster." But Barney Frank, one of the authors of the law, believes the real disaster would come from dismantling this key Wall Street reform law. "You would have what led to the 2008 crash," Frank told CNNMoney in an interview. Specifically, he said the law prevented banks from amassing enormous amounts of risky loans that can't be repaid and jeopardizing the entire country's financial system as a result. "At some point, all of that unrepayable debt causes the system to crash," Frank said. The former Democratic Congressman spoke just days after Trump vowed to "do a big number" on the 2010 legislation. Named for Frank and his colleague, former Senator Chris Dodd, the law was put in place to prevent another Wall Street meltdown. Despite the rhetoric, most analysts believe a complete repeal of Dodd-Frank isn't likely. But financial regulation is expected to be watered down, perhaps significantly. Trump signed an executive order last Friday that kicked off the deregulation effort. Frank admits that Dodd-Frank isn't perfect. He even agrees with a key criticism that community and midsize banks incurred heavy legal costs as a result of the law and need to get some relief. But Frank doesn't buy the president's complete dismissal of Dodd-Frank as a disaster. 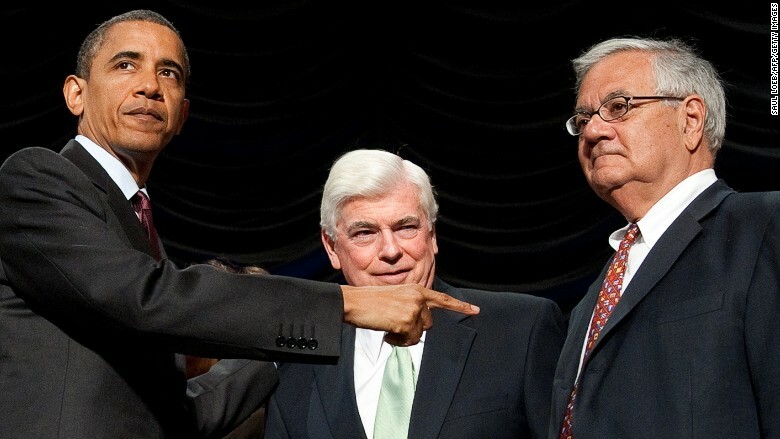 Then-President Obama celebrates the July 2010 signing of the Wall Street reform law co-authored by former Senator Chris Dodd (middle) and Rep. Barney Frank (right). Frank said there's "no evidence" to support that argument and called out Trump for failing to give specific data. "Calling it a 'disaster' is just not rational conversation," Frank said. "If we had inflicted a disaster on the American financial system, it would have shown up. There's just nothing to it." Indeed, research from the Federal Reserve doesn't show obvious signs of businesses starving of capital. Seventy-nine percent of small businesses that applied for a loan or line of credit were approved for at least some financing, according to a 2015 Fed survey. However, only 50% of firms were approved for the total amount of credit they sought, the survey shows. Trump, seated next to Wall Street CEOs, said that he has friends who have not been able to get loans because of the law. Frank found it "very odd" that Trump was surrounding himself with Wall Street CEOs. He called it a "glaring inconsistency" because Trump's campaign criticized big banks and even put out an ad that villainized Goldman Sachs. Yet last Friday, Trump praised JPMorgan boss Jamie Dimon and signed the executive order with former Goldman Sachs president Gary Cohn standing behind him. Cohn is one of a handful of Goldman Sachs veterans Trump has named to his administration, including treasury secretary nominee Steven Mnuchin. Frank admits that Dodd-Frank has unfairly hurt some smaller banks by exposing them to compliance costs they can't afford. It would be "perfectly reasonable" to exclude smaller banks with less than $100 billion or $125 billion in assets from the Volcker Rule, Frank said. The rule, named after former Fed chief Paul Volcker, prevents banks with over $50 billion assets from making risky bets with their own money. "I do think there's been a problem with community banks," said Frank, who is currently on the board of Signature Bank, a New York lender quickly approaching the $50 billion level. 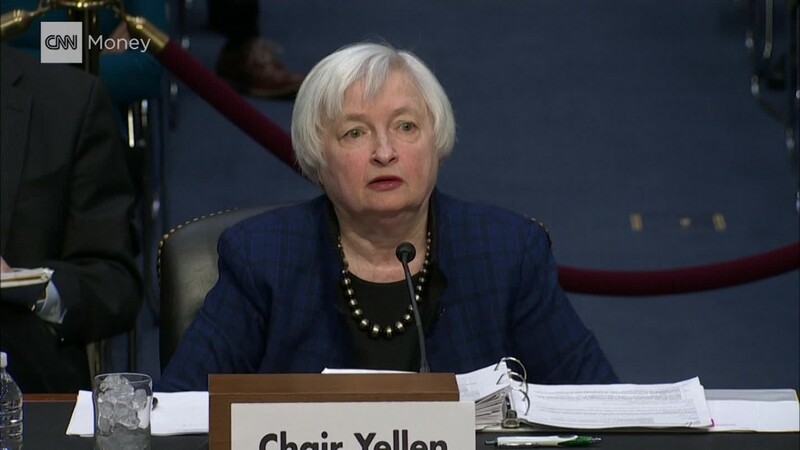 But he said his support for raising the Volcker Rule threshold predates that 2015 board appointment. Likewise, Frank "absolutely" agrees with a recent move by the Fed intended to ease the Dodd-Frank burden on smaller banks. Last month, the Fed gave a break to regional banks by letting lenders with less than $250 billion in assets skip annual stress tests. Frank stressed several key elements of Dodd-Frank that he believes are essential to keep intact. Consumer protection: Dodd-Frank created the Consumer Financial Protection Bureau, the financial watchdog conceived by Senator Elizabeth Warren. Republicans have threatened to defang the CFPB, which has gone after big banks like Wells Fargo for taking advantage of American consumers. Mortgage guidelines: The subprime mortgage crisis was caused by banks handing out mortgages to people with little or even no documented income. But Dodd-Frank requires banks only lend to people who show they have the ability to repay their mortgages. Exotic derivatives: AIG's implosion showed how financial institutions were able to use complex derivatives to quietly rack up way more debt than they could repay. Dodd-Frank brought transparency to the once-opaque trading of derivatives by requiring it to largely take place on exchanges. No taxpayer-funded bailouts: The Fed's $182 billion bailout of AIG outraged many Americans. As a result of Dodd-Frank, the Fed has limited its ability to craft rescues for specific firms in the future. Dodd-Frank also prohibits the government from using taxpayer funds to prevent the liquidation of failing financial institutions. Bigger rainy day funds: The law required regulators to rethink how much money banks need to absorb losses on their risky loans. Today, big banks have stocked up on loss-absorbing capital to weather the next storm.